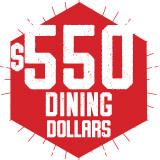 Dining Dollars are like a gift card for food on campus! 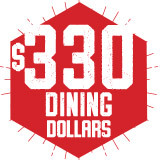 Dining Dollars can be used at any of our locations and you can add them on at any time. Questions about meal plans? Please contact the VSU 1Card Services office at mealplans@valdosta.edu if you have questions/concerns about the meal plan assigned to your account and associated charges; issues relating to the adding/deleting/changing your meal plan; or if you experience problems when trying to access your meal plan via your 1Card. Email correspondence should be sent from your valdosta.edu email account and should include your VSU student I.D. number (870# on your 1Card) and as much detailed information as possible. All other dining questions/concerns should be directed to Blazer Dining (see Contact Us).